Pain Physicians NY (Brooklyn, Queens, Manhattan, Bronx NYC) is one of the first practices in New York to offer Platelet Rich Plasma (PRP) Injections for patients suffering with Chronic Knee Pain. Our facility equipped with the most advanced, cutting edge equipment to treat knee injuries. Our Brooklyn knee pain specialists are best in region. We were selected to be a part of the international medical team for the Rio Olympic Games. Chronic knee pain includes all types of severe pain affecting the entire knee or even a specific area of the knee. The knee is one of the most commonly used joints in the body and such chronic pain symptoms are usually debilitating, affecting the quality of life. Treatment and management of chronic knee pain will depend on the underlying condition that has caused it. Those who have a more physical lifestyle are a higher risk of knee pain than those with a sedentary lifestyle. 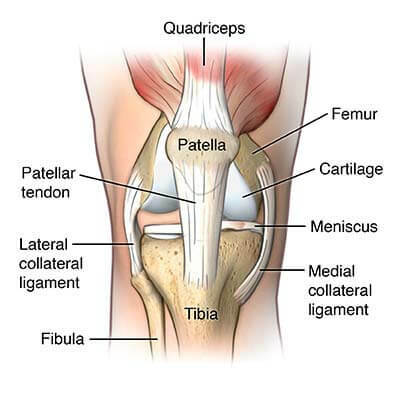 In such cases, the main cause is usually an inflammation of the tendons that pass over the kneecap (patella) connecting the thigh muscles to the shinbone. Excessive physical activity or intensive activity after a long time could cause a strain on these tendons, causing them to be inflamed and painful. This condition is known as tendonitis and is not serious. However, if the individual overexerts an already strained tendon the tendon can become damaged leading to chronic knee pain. Besides the tendons at the front of the kneecap, there are various other tendons that keep the knee stable. Due to sports or unusual movements, these ligaments, too, can become inflamed or even torn leading to severe knee pain. Such cases can be so severe that surgery is recommended to remove the affected tendons. The cartilage, on the other hand, covers the ends of your bones to provide lubrication between bones. Cartilage around the knee bones are called menisci, and these menisci can be torn causing a meniscus tear. This causes chronic knee pain that typically requires surgery. This is a degenerative condition that gradually causes the bones at the knee or any other body part to deteriorate. When arthritis of the knee happens, the knees become stiff and swollen, and eventually the knees will be very painful to move. Repetitive movement of the knee or even kneeling for long periods can cause fluids to build up in the knee joint. It is particularly common among those whose job involves kneeling, hence its name ‘housemaid’s knee’ aka knee bursitis and even sports players. It often causes severe pain accompanied by swelling around the knee that is tender to the touch. Due to a serious injury, a condition known as hemarthrosis, bleeding into the knee joint can occur. Some of the common causes include fractures and cruciate ligament tears which cause a major vein or artery to burst or be pierced. Such a condition is noted by a swelling, bruising or warmth and can become fairly serious; immediate medical attention is advised. This happens when uric acid builds up in the body causing crystals to form in the joints. These joints become inflamed and painful, also leading to chronic knee pain. Symptoms of gout in the knee include reddening of the knee and also heat emanating from the knee. The diagnosis of chronic knee pain depends from its underlying cause. However, each of these conditions are diagnosed based on a detailed physical examination and anamnesis, X-ray of the affected knee, CT or MRI scans as well as other imaging tests. Your doctor will order the necessary tests and examinations based on your signs and symptoms. How is chronic knee pain treated? Injections and sometimes even surgery. If you experience chronic knee pain and haven’t found lasting relief through more conventional knee pain treatments, medical marijuana treatments offered by our doctors may be right for you. Call medical marijuana doctors of Pain Physicians NY with locations in Brooklyn, Queens, Manhattan and Bronx NYC to help you determine if medical marijuana treatment is right for your knee pain. How is chronic knee pain prevented? Some causes of chronic knee pain can be prevented by diagnosing and treating them correctly once they occur, during their acute phase. However, there are things that you can do to relieve chronic knee pain. Usually, chronic knee pain tends to get worse after overuse or physical activity. So, a smart thing to do is to warm up before any physical activity. You should also lose weight if overweight or obese. With every extra pound you weight than you normally should, your knee needs to absorb about 4 extra pounds of pressure when walking or running. Make sure to wear comfortable shoes. Change your running shoes frequently. Do not wear worn up shoes. Use shoe inserts if necessary which can relieve your knee pain.